OnePlus has officially launched OnePlus 5 Smartphone with a Dual Rear camera, Snapdragon 835 Processor and 8GB of RAM.Checkout Specs, Price, Features comparison between OnePlus 5 and OnePlus 3T. Both Phones comes with a Metal build design and the Fingerprint Scanner on the front. OnePlus comes with a Dual Rear Camera Setup. On Display, OnePlus 5 has a .5-inch (1920×1080 pixels) Full HD Optic AMOLED 2.5D curved Corning Gorilla Glass 5 display whereas OnePlus 3T has a 5.5-inch (1920×1080 pixels) Full HD Optic AMOLED display with 2.5D curved Corning Gorilla Glass 4 protection. 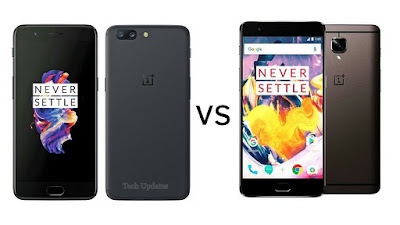 OnePlus 5 is Powered by a 2.45GHz Octa-Core Snapdragon 835 64-bit 10nm processor whereas OnePlus 3T has a 2.35 GHz Quad-Core Snapdragon 821 processor.OnePlus comes with a 6/8GB LPDDR4x RAM and 64GB/128GB (UFS 2.1) internal storage compared to 6GB RAM and 64GB/128GB internal storage on OnePlus 3T. On Camera, OnePlus 5 has a Dual 16MP rear camera with dual LED Flash, Sony IMX398 sensor, f/1.7 aperture, 1.12μm pixel size, EIS + 20MP camera with f/2.6 aperture, Sony IMX350 sensor, 1.0μm pixel size, 4K at 30fps, 1080p at 60 fps, 720p slow motion at 120fps and 16MP front-facing camera with Sony IMX371 sensor, 1.0μm pixel size, f/2.0 aperture compared to 16MP rear camera with dual-tone LED Flash, Sony IMX298 sensor, PDAF, f/2.0 aperture and 16MP front camera on OnePlus 3T.Both Phones runs on Android 7.1.1 based on Oxygen OS and will get Android O Update. OnePlus 5 comes in Midnight Black and Slate Gray color priced at $479 in the US and €499 in Europe for 6GB RAM model and will be officially available from June 27.India launch on June 22 expected to be priced at Rs 32999 whereas OnePlus 3T is priced at Rs 29,999 for 64GB and Rs 34999 for 128GB model.OnePlus 5 offers Faster Processor , Improved camera and Design similar to Apple iPhone 7 Plus.